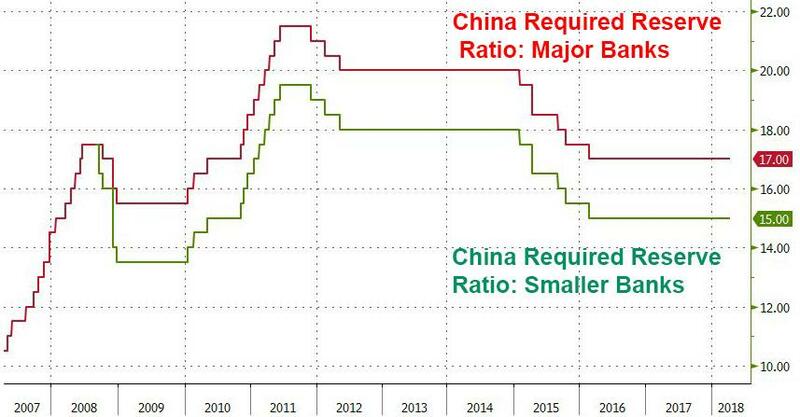 It’s only logical that one day after Trump accused China (and Russia) of playing the “currency devaluation game” in a time of rising Fed rates, that Beijing would respond by doing precisely what it was accused of, and moments ago the PBOC announced that effective April 25, China’s central bank will cut the reserve requirement ratio (RRR) for qualified banks by one percentage point.The new targeted RRR will be effective April 25. Looking forward, we continue to expect a modest deceleration in growth stretching over the course of the year, as slower credit expansion and — potentially — protectionist trade policies take a toll. Our credit impulse — which measures the change in new credit as a share of GDP — is now pointing firmly down. Still, from 6.8% in 1Q our 6.3% call for the year as a whole is looking too pessimistic and we will revisit it.